Photograph, Aerial view of Sam Houston Hall, the host building for the 1928 Democratic Convention. Courtesy of Houston Past. Image available on the Internet and included in accordance with Title 17 U.S.C. Section 107. Entry ticket for the 1928 Democratic Convention. Image available on the Internet and included in accordance with Title 17 U.S.C. Section 107. DEMOCRATIC NATIONAL CONVENTION OF 1928. In the winter of 1927 Jesse H. Jones traveled to Washington, D.C., with a certified check for $200,000 to enter Houston's bid for the Democratic National Convention to be held the following summer. His proposal was initially met with skepticism since Houston, a booming but still relatively small city of just 300,000, could not compete with the venues and accommodations offered by larger, more established metropolises like San Francisco, Cleveland, Detroit, and Chicago. Serious concerns also existed regarding the oppressive midsummer heat and humidity of the Bayou City, which would be the southernmost city ever to host a national party convention. However, in what is generally recognized as a conciliatory move, the national committee accepted the city's offer. Even then the nomination of Al Smith—the Catholic, Tammany Hall-backed New York governor who aggressively opposed prohibition—seemed likely, and national party officials in the East felt the need to appease the Protestant, prohibitionist South, which had not hosted a national convention since before the Civil War. Preparations in Houston began almost immediately. Sam Houston Hall, with a seating capacity of 16,000, six acres of floor space, an open-air ceiling, and giant "typhoon" fans to aid air circulation, was built in just sixty-four working days. National Democratic Convention (1928). Courtesy of the Library of Congress. Image available on the Internet and included in accordance with Title 17 U.S.C. Section 107. Photograph, members waiting for the Democratic Convention to begin. Image available on the Internet and included in accordance with Title 17 U.S.C. Section 107. Photograph, Picture of Al Smith, nominee for the Democratic candidacy. Image available on the Internet and included in accordance with Title 17 U.S.C. Section 107. 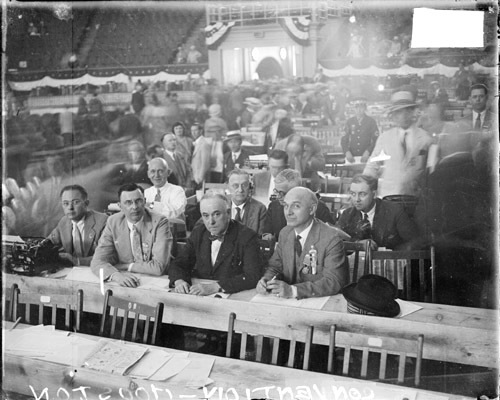 The convention opened on June 26, 1928. Al Smith remained in Albany but faced little competition from other candidates. Other names placed in nomination included Senator James Reed of Missouri, Representative Cordell Hull of Tennessee, and Jesse H. Jones of Texas. However, no contender provided a serious threat to Smith, and most candidates agreed to stand behind the party and support the convention's nominee. At the first roll call, Smith received 724 2/3 votes, ten short of the number (two-thirds of the total) required for nomination. Ohio then switched its votes to Smith, and other states followed suit. Texas, the notable exception, cast its forty votes for Jones. State politicians had long opposed Smith's nomination. Former Texas governor Oscar B. Colquitt publicly argued that Smith sought to nullify a provision of the Constitution only because it "happened to be out of harmony with his personal opinions," and that "to nullify this part of the organic law will bring contempt for other parts of it." Nevertheless, Smith easily won the nomination in Houston with 849 2/3 votes. Although women's temperance groups and the local Baptist church held all-day and all-night prayer meetings near the convention hall and insisted that God would intervene to prevent the "catastrophe" of Smith's nomination, inside the hall the delegates saw Smith as their only hope of victory over the Republicans in the fall. With Smith nominated, party officials looked to the vice-presidential slot and the official platform as means of ensuring harmony within the party. Many observers perceived the Texas delegation, in particular, as aloof and hostile towards Smith. Judge George W. Olvany, a Tammany Hall leader, therefore sent his and Jesse Jones's friend Col. Joseph M. Hartfield to offer Jones the nomination for vice president. Jones declined, and the Texas delegation considered supporting either Maj. Gen. Henry T. Allen, commander of the Nineteenth Division, or, a more likely possibility, Senator Alben Barkley of Kentucky. However, upon the prodding of one state delegate who insisted that the Texas delegation get "behind the ticket and [show] New York and the Democratic Party that Texans were true Democrats," the Texas delegates unanimously decided to support Smith's choice, Senator Joseph T. Robinson of Arkansas, the Democratic minority leader. Robinson supported prohibition and was the first southerner, apart from Woodrow Wilson, to have a place on the national ticket since the Civil War. Harmony prevailed as well in the drafting of the party platform. The most heated controversy centered around prohibition and its enforcement. Texas governor Daniel J. Moody, Jr., was expected to pursue a floor fight for a "bone-dry" plank on prohibition. However, when the proposed plank, which pledged "the party and its nominees to an honest effort to enforce the eighteenth amendment and all other provisions of the Federal Constitution and all laws enacted pursuant thereto," was accepted by such recognized prohibitionists as former secretary of the navy Josephus Daniels and Methodist bishop James Cannon, Moody decided to relinquish his fight. 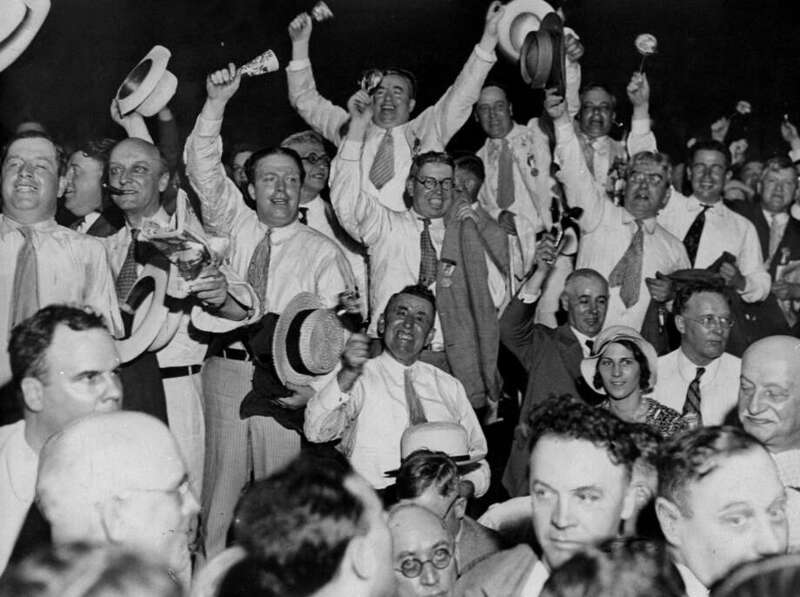 Photograph, Men cheering after hearing the news of Al Smith's candidacy for President at the 1928 Democratic Convention. Courtesy of New York Daily News Archive. Image available on the Internet and included in accordance with Title 17 U.S.C. Section 107. The convention ended on June 29. During the final moments a telegram from Smith accepting the nomination was read to the delegates. Many of the dry delegates were stunned by the party's stand on prohibition and immediately questioned the appropriateness of their candidate. The nominee's message read, "It is well-known that I believe there should be fundamental changes in the present provisions for national prohibition. . . . I feel it to be the duty of the chosen leader of the people to point the way which, in his opinion, leads us to a sane, sensible solution of a condition which, I am convinced, is entirely unsatisfactory to the great mass of our people." Poster, advertisement for presidential candidates in 1928. Image available on the Internet and included in accordance with Title 17 U.S.C. Section 107. The candidate's remarks prompted many anti-Smith Democrats eventually to join forces with Republicans and elect Herbert Hoover in November 1928. In Texas the massive defection of Democrats was attributed both to Smith's antiprohibition views and his Catholicism. The state gave Hoover a majority, the first time in history that a Republican presidential candidate had carried Texas. The election had severely divided the Democrats and in some respects foreshadowed a significant decline in the state's support of the national Democratic party in the coming years. Norman D. Brown, Hood, Bonnet, and Little Brown Jug: Texas Politics, 1921–1928 (College Station: Texas A&M University Press, 1984). David Burner, The Politics of Provincialism: The Democratic Party in Transition, 1918–1932 (New York: Knopf, 1970). New York Times, June 29, 30, 1928. Roy V. Peel and Thomas C. Donnelly, The 1928 Campaign (New York: Richard R. Smith, 1931). Handbook of Texas Online, Ada Ferrer, "DEMOCRATIC NATIONAL CONVENTION OF 1928," accessed April 21, 2019, http://www.tshaonline.org/handbook/online/articles/wbd01. Uploaded on June 12, 2010. Modified on February 25, 2017. Published by the Texas State Historical Association.